There’s no reason to overcomplicate a recipe with a ton of ingredients when a simple approach tastes this good. These Baked Cinnamon Apples require only a few ingredients, come together in just one bowl, and bake up perfectly every time. 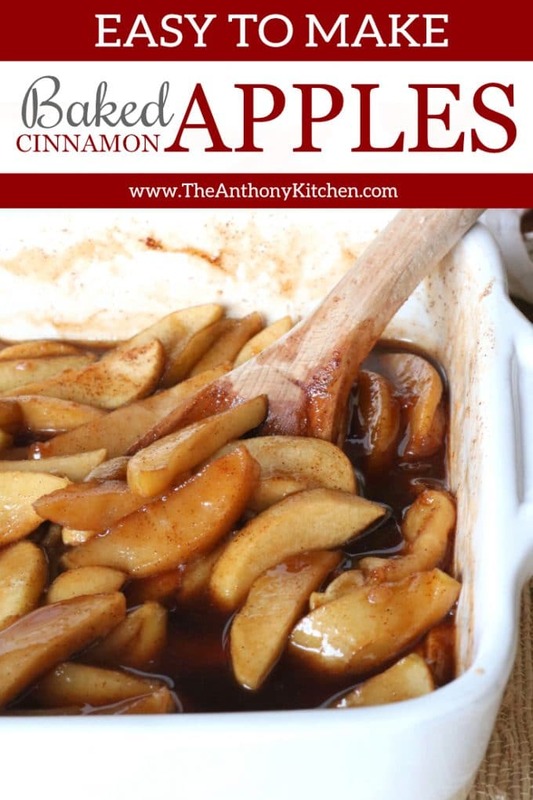 Today, we’ll not only cover the three basic steps to baking perfect cinnamon apples coated in a sweet cinnamon syrup, you’ll also leave here knowing which apple varieties work best for baking, the easiest way to slice apples, why it’s totally fine to leave that nutmeg behind, and more! I’ve been making the stovetop version of sliced cinnamon apples for my little girl for what feels like forever. With school starting back up and fall right behind it, it seemed the perfect time to get a new apple recipe underway that our weekday mornings would benefit from. The goal was to adapt the stovetop version into a simple oven-baked version, in which the prep would be extremely minimal, and the recipe as simple as could be, without sacrificing any flavor. As an added bonus, it would also make enough to get us through the week. Almost sounds too good to be true, but alas, it is not. Over-the-top easy to assemble and came together in just one bowl. Perfect in texture — not too soggy, and with just the right amount of bite. Beautifully cloaked in a perfectly gooey, cinnamon sauce. Not to mention, the recipe made enough to last for days and kept beautifully. Mix ingredients for the sauce. The first thing you’ll want to do is prepare the apples. But first, what kind of apples? Well, I’m glad you asked because this actually matters and can affect the final product. Some apple varieties are firmer than others, and when baking, the firmer apples will retain more texture than a softer apple. Examples of apples with a crispy bite would be Honey Crisp (my personal favorite), Jazz, Pink Ladies, Fuji, and Granny Smith apples. Apples with a soft texture would be Golden Delicious (perfect for Apple Crumble Muffins), Braeburn, and Cortland apples. 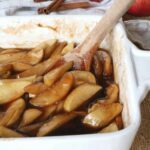 For this recipe, I’d recommend going with a firmer apple, unless you just really love soft, mushy food. In which case, feel free to go with a softer apple. I use a Y-peeler to peel my apples. They work wonderfully on rounded fruits and seem to speed along the process. As far as cutting the apples go, ditch the fancy accessories. The most efficient way to cut in apple is to simply cut it into quarters around the core. Then, lay each quarter flat-side down, and cut each quarter into 1/4″ slices. The ease of this recipe is truly a beautiful thing, and it all comes together in one big bowl. So not only are we slamming out an incredible batch of baked cinnamon apples, we’re also lightening our dish load. Yes, please. The sauce begins with a cornstarch thickener, which is as simple as adding water to cornstarch. Well, that was easy, wasn’t it? The rest of the sauce ingredients — sugar, cinnamon, and salt –go in and get a good stir. BAKED APPLES WITHOUT NUTMEG, CLOVES, OR ALLSPICE — BLASPHEMOUS OR GENIUS? You might have noticed this recipe doesn’t call for allspice, ground cloves, or nutmeg. These are all great additions to apple recipes, however, you really don’t need them. You can make a stellar, drool-worthy batch of Baked Cinnamon Apples without an onslaught of additional spices. You won’t miss a thing — guaranteed. You’ll also see that lemon juice is optional for this recipe. Again, to keep things as simple as possible for you. However, I will say, it adds a nice touch to the mix if you happen to have some on hand. 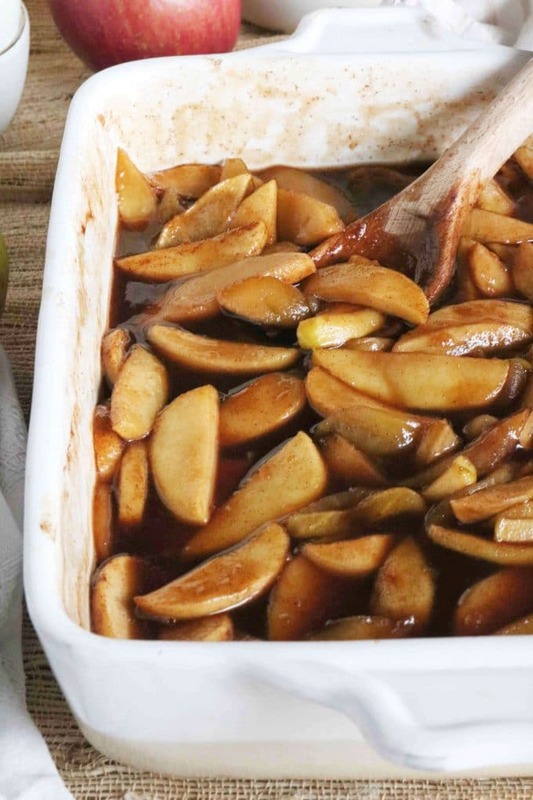 Add the apples to the sugar mix, toss to coat, and you’re ready to bake. For real. That’s how easy this recipe is. 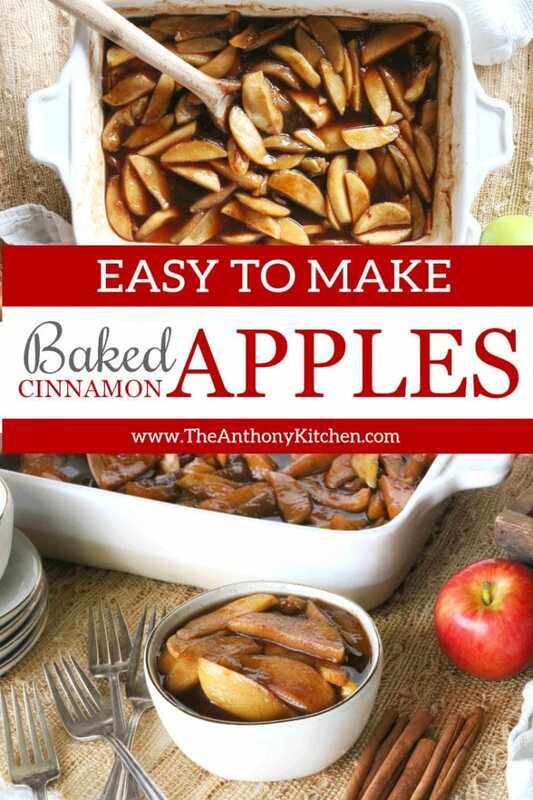 This recipe makes sliced cinnamon apples for days…unless you’re serving it to company, in which case I’m sad to report, you’ll probably only have apples for a day. Never-the-less, it’s a fair amount of apples and they’ll bake up best in a standard 9″x13″ casserole dish. We’ll add the apples and the sauce to the dish, and cover it up with aluminum foil for the majority of the bake time. 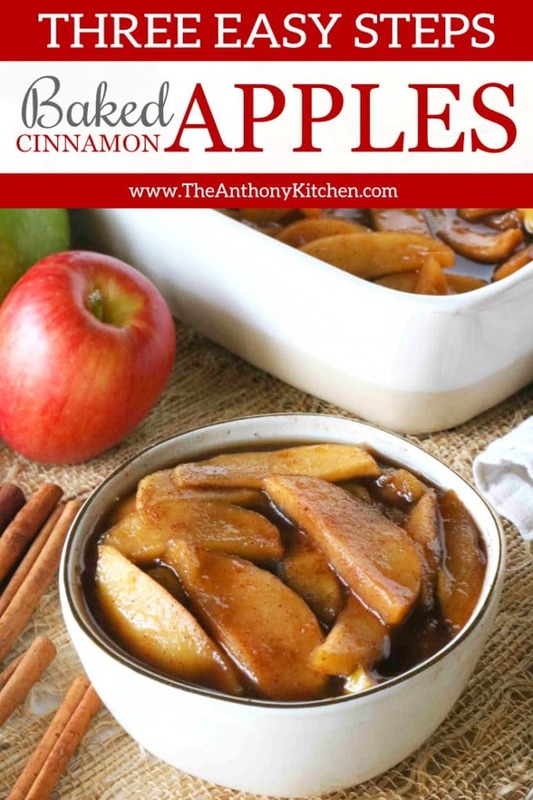 This will help the cinnamon apples to cook evenly and prevent any of the sugar from burning. Then, remove the foil, give them a quick stir, and return to the oven for a few more moments. When it’s all said and done, they’ll come out perfectly glazed in a dreamy caramel sauce, just begging for a taste. 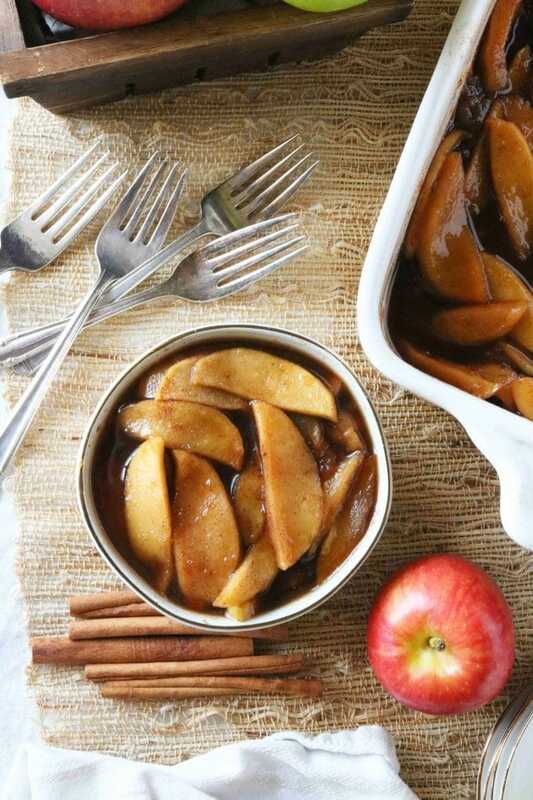 Baked Cinnamon Apples can be made-ahead days in advance. To store them, allow to cool slightly and place them in an airtight container for up to 5 days. Serve alongside a nice, juicy pork chop. Use as an easy, gluten-free dessert, and serve hot over a giant scoop of vanilla ice cream, with a sprinkle of chopped pecans and a dollop of whipped cream! And, as we all know, cinnamon apples slices are perfect for big family breakfast events like Christmas morning and holiday brunches, but they’re especially amazing for weekday mornings. You know the kind. Those mornings you really need the kids to eat their breakfast in a timely manner…and not just stare at their plate. 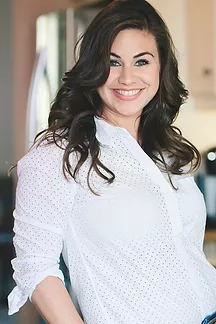 I simply scoop out a serving, heat them up, and hand them over to my daughter along with a little protein. She eats, she’s happy, and I’m really happy. We’ve just had smooth-sailing morning, all thanks to a seriously easy batch of sliced cinnamon apples. Please, enjoy! Baked Brie with Apples and Walnuts is a crowd-pleasing appetizer perfect for the fall and winter. It’s a beautiful combination of savory and sweet, and addictively yummy! Apple Crumble Muffins are just as good, if not better, than any bakery version out there! They’re fluffy, tender, full of apple goodness, and well-equipped with the perfect crumble topping! If you’re looking for a festive apple dessert everyone will adore, you’re going to need this Apple Pudding Cake recipe. It’s a quick fix recipe, that’s decadently moist, with cinnamon apples running throughout the cake and an extra serving of apples on top! This one doesn’t necessarily contain apples, but it was quite literally made for them. 10-Minute Caramel Apple Dip is a sweet, cheesecake-like dip, with a topping of caramel and chocolate toffee bits. And, did you happen to catch that whole 10-minute thing? Oh, yes. This one is a winner. Easy Homemade Apple Pie is easy as pie…or in the literal form, the easiest apple pie. All you need for perfect apple pie is this simple apple pie filling and buttery, flaky crust. All of which, this pie recipe is equipped with. 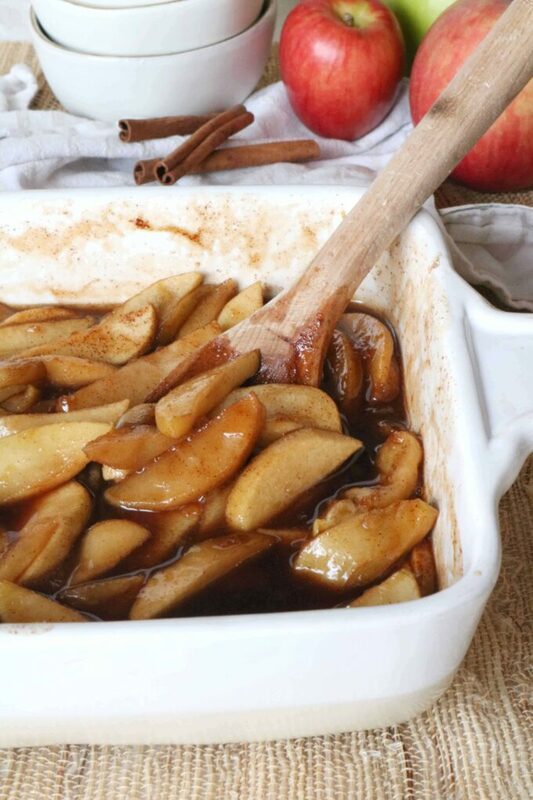 A seriously easy recipe for Baked Cinnamon Apples in the oven. Preheat the oven to 375° and have ready a 9x13" baking dish, and aluminum foil. In a large mixing bowl, add cornstarch along with 2 tablespoons of cold water. Stir to combine. Add an additional 2/3 cup of water, brown sugar, cinnamon, salt, and lemon juice. Add the apples and stir until evenly coated. 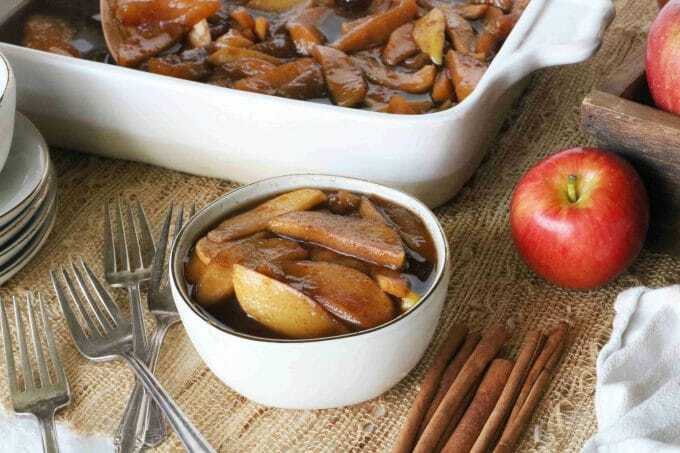 Transfer the apple and sugar mixture to the casserole dish, and cover with aluminum foil. Bake for 30 minutes. Remove the aluminum foil, stir and bake for 15 minutes more, uncovered. Allow to cool slightly, serve, and enjoy. Will keep for up to 5 days in the refrigerator. Perfect side dish for so many meals or as a topping for so many desserts. 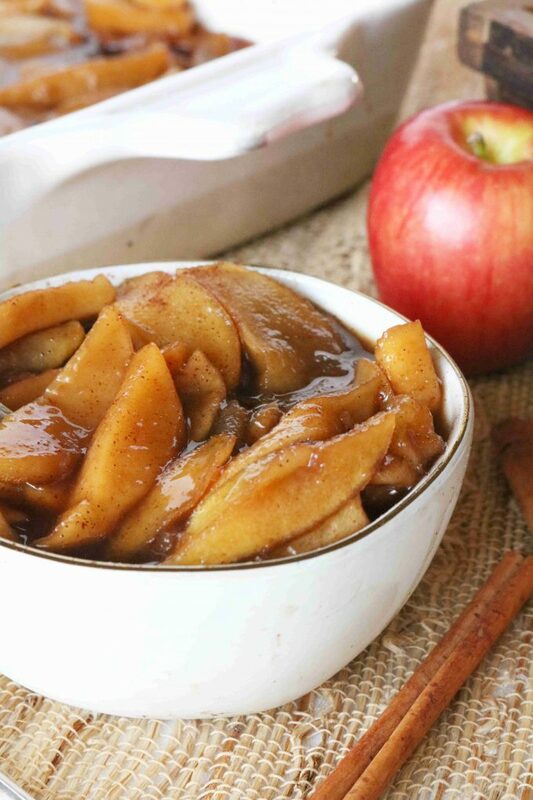 Cinnamon apples sound utterly delicious, a perfect combination of Autumn flavours. They would make a great dessert, served with vanilla icecream. 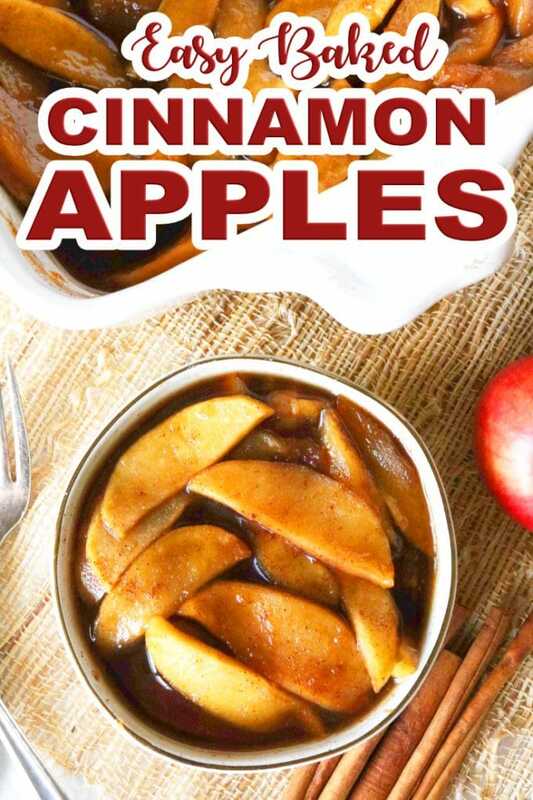 This cinnamon apples sounds so good! I can’t WAIT to try this! Thank you for this great recipe! looks so warm and comforting! Yummy! These apples look delicious! I agree that you don’t need all those spices…cinnamon is enough. My favorite apple is Fuji. 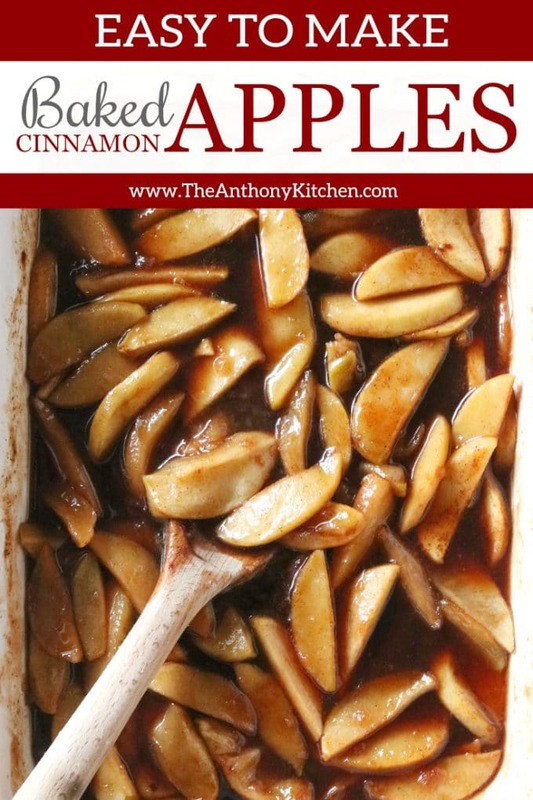 Oh how I loved baked cinnamon apples! You’re preparation is so easy to follow, a no-fail recipe!! Apple is my favourite dessert fruit! 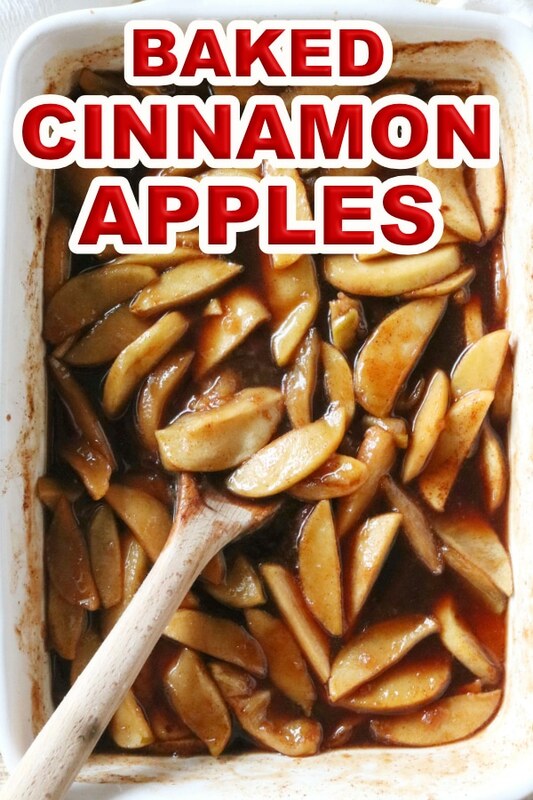 These baked cinnamon apples look so tasty! And I love that it’s such an easy recipe. I can imagine how good it would be with vailla ice-cream!